Once considered the only metal fit for a king, these days' mens platinum wedding bands are enjoyed en masse and are certainly fit for the king in your life. In a class of its own, platinum is more precious than gold and is considered the most luxurious and lavish metal in the jewelry industry. Our collection of mens platinum bands range from traditional and conservative styles, to more contemporary and artistic creations - all the while highlighting the beauty and rarity of our quality platinum. Our designer platinum wedding bands for men are made with superior grade 950 pure platinum - proving in our collection, quality is never compromised to style. Our mens platinum rings are also hypoallergenic, a perfect choice for those with sensitive skin, taking the stress out of having to remove the ring for certain periods of the day. This collection of wedding bands for men have a naturally silvery white appearance that adds to both their beauty and the high status that platinum carries. As beautiful and as rare as platinum is, it is also durable and will stand the test of time. 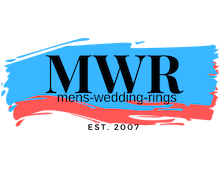 Your stunning platinum wedding band from Mens-Wedding-Rings.com won't tarnish through wear and tear, nor change color over time, despite the daily rigors of life. Whether polished beveled edges, a full polished finish or an elaborate satin finish with inset diamonds is more your style, we've got every style covered for your special day. If you have any questions about our elegant collection of platinum wedding rings, don't hesitate to contact our supportive team of experts. We're here to help you choose the perfect ring and to to take the stress off wedding ring shopping!